The iconic Juche Tower. From Wikipedia: Completed in 1982, the Tower is situated on the eastern bank of the River Taedong, directly opposite Kim Il-sung Square on the western side of the river to commemorate Kim Il-sung's 70th birthday. Although his son and successor Kim Jong-il is officially credited as its designer, interviews with former North Korean officials contradict this assertion. 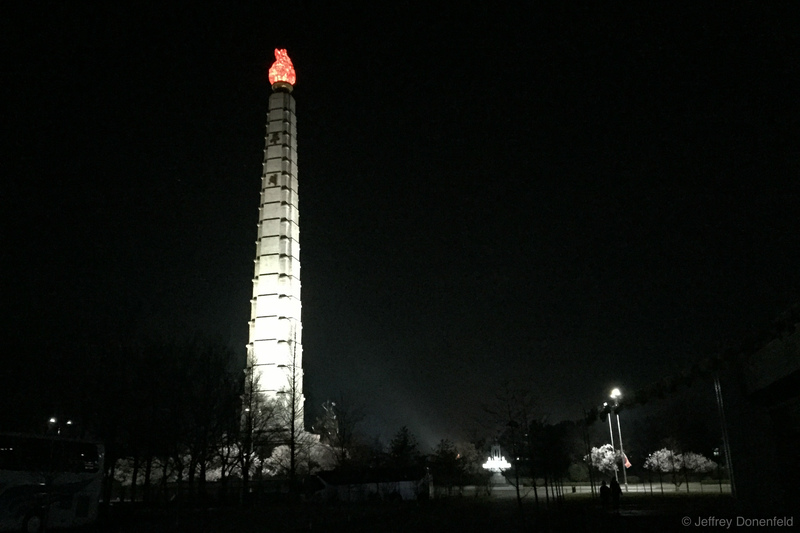 The 170-metre (560 ft) structure is a four-sided tapering 150-metre (490 ft) spire – the tallest in granite – containing 25,550 blocks (365 × 70: one for each day of Kim Il-sung's life, excluding supplementary days for leap years), dressed in white stone with seventy dividers and capped with a 20-metre (66 ft)-high 45-ton illuminated metal torch. It is possible to ascend the tower by elevator and there are wide views over Pyongyang from the viewing platform just below the torch. At its base, there are reception rooms where videos explaining the tower's ideological importance are sometimes shown. It is presumed to be modelled on the Washington Monument, which it surpasses in height by less than a meter. The Juche Tower is the second tallest monumental column in the world after the San Jacinto Monument, which is 2.9 metres (9.5 ft) taller. The lower part of the Tower of Juche Idea, with symmetric buildings in the background. Associated with the tower is a 30-metre (98 ft)-high statue consisting of three idealised figures each holding a tool – a hammer (the worker); a sickle (the peasant); and a writing brush (the "working intellectual") – in a classic communistic style reminiscent of the Soviet statue Worker and Kolkhoz Woman. The three tools form the insignia on the flag of the ruling Workers' Party of Korea. There are also six smaller groups of figures, each 10 metres (33 ft) high, that symbolize other aspects of Jucheist ideology. A wall carrying 82 "friendship plaques" from foreign supporters and Juche Study Groups forms part of the Tower. The iconic Juche Tower. From Wikipedia: Completed in 1982, the Tower is situated on the eastern bank of the River Taedong, directly opposite Kim Il-sung Square on the western side of the river to commemorate Kim Il-sung’s 70th birthday. Although his son and successor Kim Jong-il is officially credited as its designer, interviews with former North Korean officials contradict this assertion. The 170-metre (560 ft) structure is a four-sided tapering 150-metre (490 ft) spire – the tallest in granite – containing 25,550 blocks (365 × 70: one for each day of Kim Il-sung’s life, excluding supplementary days for leap years), dressed in white stone with seventy dividers and capped with a 20-metre (66 ft)-high 45-ton illuminated metal torch. It is possible to ascend the tower by elevator and there are wide views over Pyongyang from the viewing platform just below the torch. At its base, there are reception rooms where videos explaining the tower’s ideological importance are sometimes shown. It is presumed to be modelled on the Washington Monument, which it surpasses in height by less than a meter. The Juche Tower is the second tallest monumental column in the world after the San Jacinto Monument, which is 2.9 metres (9.5 ft) taller. The lower part of the Tower of Juche Idea, with symmetric buildings in the background. Associated with the tower is a 30-metre (98 ft)-high statue consisting of three idealised figures each holding a tool – a hammer (the worker); a sickle (the peasant); and a writing brush (the “working intellectual”) – in a classic communistic style reminiscent of the Soviet statue Worker and Kolkhoz Woman. The three tools form the insignia on the flag of the ruling Workers’ Party of Korea. There are also six smaller groups of figures, each 10 metres (33 ft) high, that symbolize other aspects of Jucheist ideology. A wall carrying 82 “friendship plaques” from foreign supporters and Juche Study Groups forms part of the Tower.